Where does Texas corn go? From head to toe, corn plays a big role in our everyday lives. Whether it’s in your gas tank or on your dinner plate, corn is used for more than 4,200 different purposes! So many a-maize-ing types of corn! While driving down the highway and passing thousands of acres of corn, chances are you’re seeing field corn! Field, or dent, corn is the most widely grown corn in the U.S. and makes up 99% of corn production. Field corn is harvested after the ear reaches physical maturity. 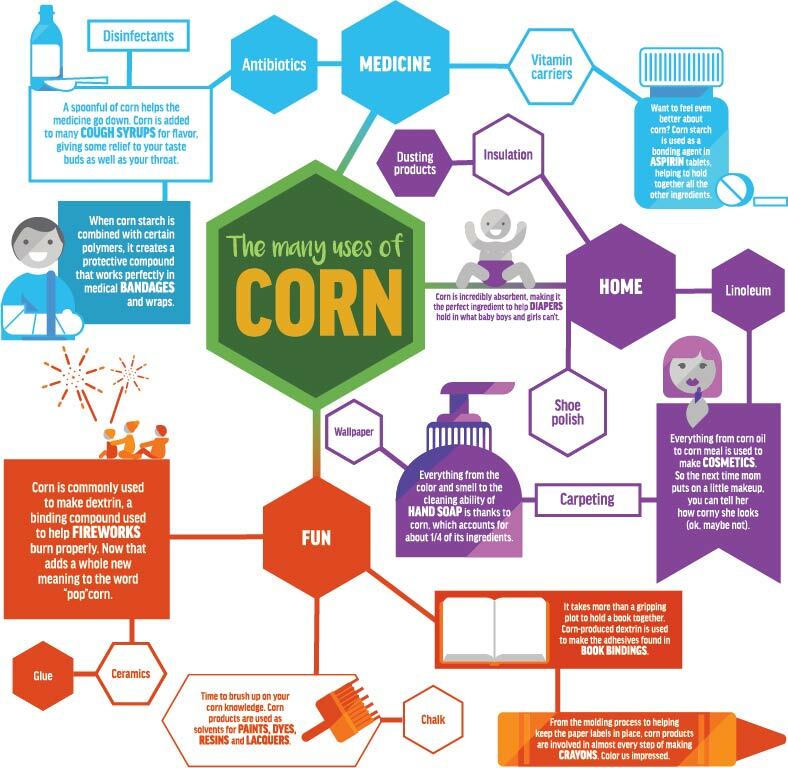 Products such as livestock feed, ethanol, plastics, cornstarch, and many more are made with field corn. Sweet corn is the full-kerneled product that we all love to eat and see on the shelves of our grocery stores. This corn is harvested before it reaches physical maturity to retain the sweet flavor and juice. Out of all corn produced in the U.S., only 1% is made for human consumption. Specialty and white corn are typically grown for specific purposes. White corn contains higher levels of starch, which make it perfect to be used in corn chips, tortillas, and other popular food products. Other types of specialty corn include: high-starch corn, high-oil corn, waxy corn, and high-lysine corn – all of which are designed for certain uses. Did you know more than 96% of field corn grown in Texas is used to feed livestock? More than a 1/3 of all corn grown in the U.S. is used to feed farm animals. Corn-fed animals gain weight quickly from corn’s high-starch, high-energy content. Corn also improves the yield from dairy cows, and reduces the amount of land needed to support their feed requirements. Domestic ethanol producers are turning corn into environmentally-friendly, renewable fuel that people use in cars and other engines. Ethanol is a low-carbon based fuel that is blended with gasoline for use in many different vehicles. This clean-burning, high-octane fuel contributes to the country’s energy independence and helps you get from point A to B! Did you know corn used for ethanol is also used for livestock? That’s right, ethanol production does more than produce a clean-burning fuel – it also produces a co-product called distillers grains, which is commonly fed to animals. Wet or dried distillers grains are packed with nutrients and can then be fed to livestock. It’s important to remember that nearly all of the corn used to create ethanol in Texas is actually railed in from other states. Texas livestock producers benefit from these local ethanol plants by having distillers grains in close proximity. How much corn do you eat? Can you think back to the last time you ate corn? Sweet corn isn’t the only type of corn that is consumed, but field corn is as well. While sweet corn only accounts for approximately 1 percent of corn production in the United States, 10 percent of field corn is refined and also used in food ingredients. Corn is in the products you use every day. When you use a crayon, you’re drawing with corn. Corn may also be in your clothes, medicine – even your carpet. Because of advances in technology, you can find corn in things you never would have imagined!